The French have given us many things: the Statue of Liberty, the bikini and of course, the word “juggler”. As Merriam Webster’s dictionary explains, the word “juggler” evolved from the Middle English world jogelour (a minstrel or magician), which came from the Anglo-French term jugleur. This word evolved from the Latin term joculator, a derivative of joculari, which means to joke or to jest. This word, in turn, was derived from the Latin noun iocus, which means “joke”. The evolution of this word leads us to an interesting conclusion: the first “jugglers” were not jugglers at all. 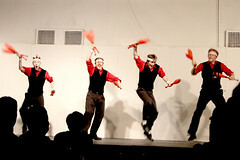 Rather, they were roving performers who made a living telling jokes, singing songs and performing various stunts (which may or may not have included juggling). They were more closely related to troubadours, jesters or minstrels and were not “jugglers” in the modern sense of the word. Often, these traveling performers were not highly regarded socially, and were known for trickery. 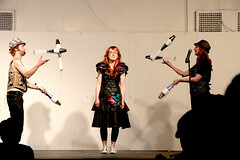 It is for this reason that “juggle” has a number of negative connotations. Dictionary.com lists “to alter or manipulate in order to deceive” and “to use artifice or trickery” as alternative definitions. 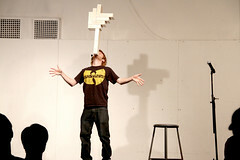 As this blog has pointed out, the word “juggling” has taken on new connotations in recent years. A quick Google News search for “juggling” will find more articles about President Obama juggling priorities in the Middle East than it will about Anthony Gatto or the International Jugglers Association. In common usage, juggling most often refers to the act of multitasking: juggling family and a career, juggling multiple lovers etc. Even among those who use “juggle” to refer to object manipulation, there isn’t any consensus as to what the word actually means. 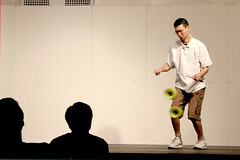 Some use the term to refer to “toss juggling”; keeping more objects in the air than number of hands used. 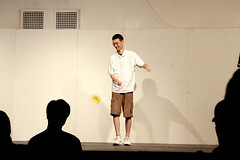 Others insist that contact juggling, which often envolves only one object, should be considered “juggling” as well. 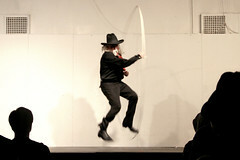 Still more think that cigar box, devil stick and diabolo should be categorized as juggling. 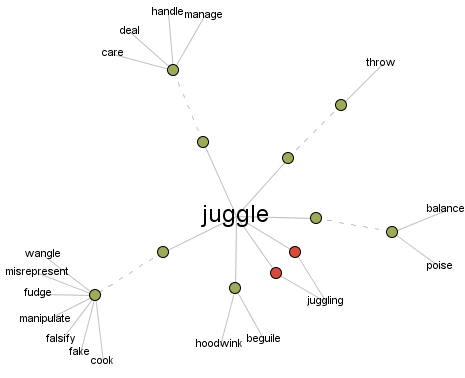 According to Merriam Website, the word “juggle” first appeared in the English language in the 15th century. If the term seems a little vague to you today, just remember that it’s been that way for nearly 600 years. 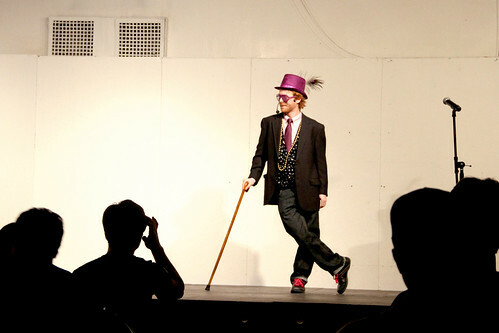 The show started off with a bang, as I came out with a purple top hat with a purple feather, purple shirt, purple tie, sequined vest and purple shoe laces. I was about to mount my purple unicycle when my arch nemesis Michael Richter (of Ringling Brothers) appeared on stage with his unicycle and stole my thunder. 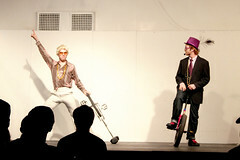 After a well-fought unicycle duel, he was escorted off stage by security. Up-and-coming diaboloist Robin Hu brought the house down with his new Sundia Fly Diabolos, which he purchased at our store just a few weeks ago. He almost chickened out of his performance but I convinced him to go on stage. I’m really glad he did, and so was everyone in attendance. 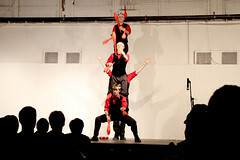 I was particularly impressed with A Different Spin, a scarlet-clad juggling troupe who showed up and asked to be included in the show. When I saw their costumes, I couldn’t refuse. They did an outstanding job, look for them in the future. 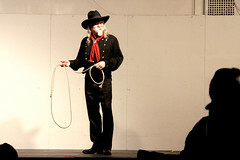 The most popular act of the night by far was Chris McDaniel, who performed an amazing wild west cowboy act. The crowd roared he cracked whips, spun ropes, and sang songs. Chris later apologized to me for going on too long, but I hadn’t noticed. Naomi was particularly impressed by his agile Texas skip, a very difficult trick. His performance was magical, and I was really grateful he came. But for me, the highlight of the evening was passing clubs around my mom, and debuting my brand new wooden stacking boxes. The boxes look really crisp on stage, and they stack up so neatly. I’m kinda obsessed with them… I stacked up 9 boxes, but the next day the legendary Jay Green taught me a new type of 9 box stack. I hope to share it with you shortly. 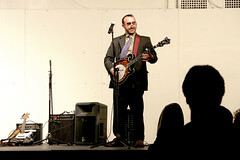 The show closed just as strong as it started, with the country-bluegrass stylings of Steve Dagz and the Scallywags. The crowd was a-hootin’ and a-hollerin’ as Steve and his quartet played the show out. All-in-all, it was one of the best nights of my life. I can’t wait to host next year’s show. If you were in attendance, let us know if you had a favorite part! Photos and post by Naomi Donabedian. Thanks to Esy Casey for equipment and guidance.